Shortly after my last post January good weather and the cold spell at the start of the month turned into snow. We had a week or 10 days of snowy weather which finally got the ground covered in the lower valley by up to 12" of snow that has held on and is only starting to shrink with sunny days and wind. 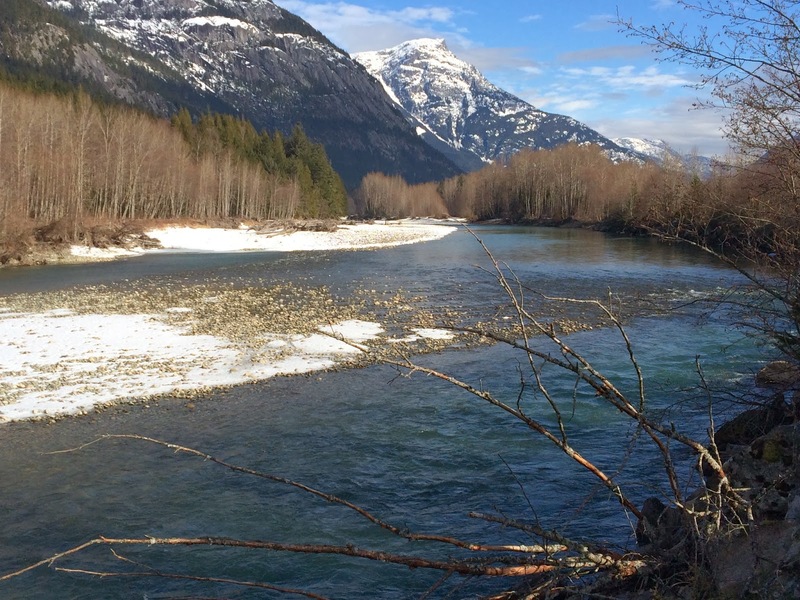 If you are a coho salmon fry in the Bella Coola River, its a perilous existence. Under normal conditions there are otters, kingfishers, mergansers and herons always looking for a meal, not to mention the voracious Dolly Varden trout and other larger fish. An unfortunate but completely normal and common event that happens is fry trapped in small pools that freeze to the bottom or lose oxygen in the remaining water under the ice. While walking along the Bella Coola River today we encountered one such pool that was likely a lovely place in the warm weather we had in January and the coho fry looked healthy. Unfortunately their home entombed them when the cold weather came and some 2-300 were frozen in the ice. The last part of January and so far the first week of February have been a story of Sun & Ice - both here in the Bella Coola Valley and the entire Province of British Columbia for the most part. Very cold temperatures and clear skies came after we were spoiled by double digit high temperatures in January. Nearby Chilcotin weather station at Puntzi Mountain has been steadily recording -39 C to -41 C lows this week, the coldest place in BC (the news media usually misses that fact because it's only a tiny community). The weather station isn't on a mountain its actually right beside the large paved WWII runway very close to Highway 20. In the Bella Coola Valley, Environment Canada has had us under a weather "Arctic Outflow Warning" advisory all week. To locals this means the "east wind" or "outflow". It's been a low of -10C to -12 C all week and depending where you live in the valley fairly windy -30-40 km/h and gusts of much higher. Living in deep U-shaped valley with 8-9000' mountains along the sides and only a very narrow picture westward means we don't get a great sky view nor many good sunsets in the Bella Coola Valley, so when one happens like tonight you have to pause and look at it because it may be a awhile before you see another.